The Mi-Ki is a rare toy-sized breed developed in the late twentieth century to be a companion dog. The Mi-Ki is reputedly an exceptional toy breed, in that it normally possesses a good-natured, relatively calm temperament, few health issues, and high adaptability to living situations. These dogs are hypoallergenic, and are low-maintenance overall. The Mi-Ki is not an official member of any breed group, but it is definitely in the Toy category. These dogs were developed in the late twentieth century to be companion dogs; as such, they are a great match for families of any size, singles, and seniors. Mi-Kis are also often utilized as therapy dogs for disabled people. The Mi-Ki is a relatively new pure breed, having been developed in the late twentieth century by crossbreeding various toy-sized dogs. Some basic Mi-Ki info: they are small-sized (8-10 inches at the shoulders in height, 6-10 pounds in weight), with either short and smooth or long and silky coats in a wide variety of colors. These dogs are very good-natured and affectionate, they require little care or maintenance, and they are extremely versatile. A Mi-Ki is also pretty bright, so training a dog of this breed will typically be easy. They are both willing to learn and eager to please, so they will respond well to any training, especially if the training is begun early in the dog's life. As with any toy breed, there is a slight chance a Mi-Ki will develop Small Dog Syndrome (fussy, selfish behavior) if not shown proper discipline. These dogs are not overly "yappy"--and in fact, some are known to yodel or emit a curious "twittering" sound rather than a standard bark. Another fascinating quality of Mi-Kis is that they are often compared to cats: they love to lie in the sun, they will often pounce on or swat at toys, and they can be easily trained to use a litterbox! Mi-Kis also are not as energetic or "hyper" as other toy breeds. While they enjoy a good romp or a long walk, they are not as active as comparable breeds like the Maltese or the Pomeranian. The Mi-Ki Club of America claims that the breed was developed in Asia sometime in the twentieth century. 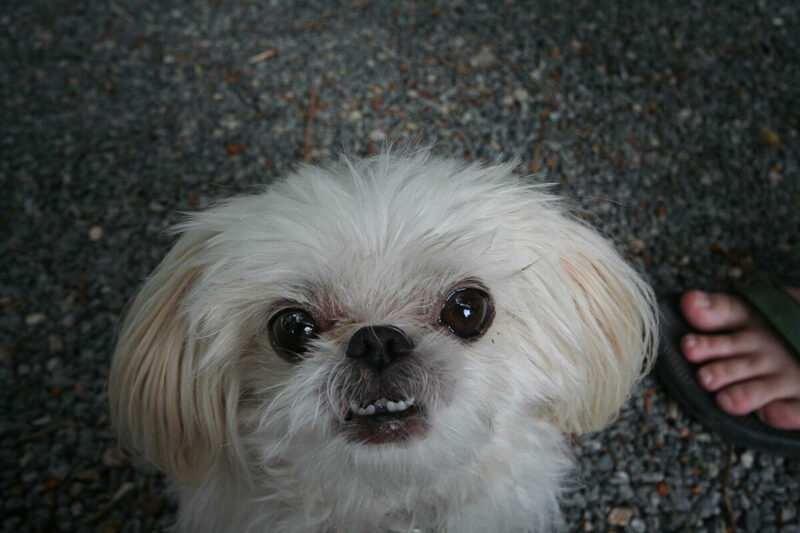 Breeders crossed several toy breeds including the Japanese Chin, the Papillon, and the Maltese to eventually create the Mi-Ki. The breed is rumored to have first appeared in the U.S. in the 1980s. Another popular theory maintains that the Mi-Ki was created by a U.S. breeder named Maureen Westburg in Milwaukee, WI in the 1980s. 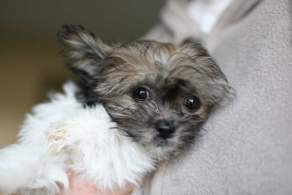 Westburg apparently crossbred the above-named breeds, along with the Shih Tzu and possibly the Yorkshire Terrier, to create a toy-sized, affectionate, non-shedding companion dog. But, according to the American Mi-Ki Club's website, Westburg failed to keep accurate records of her breeding efforts, so this claim cannot be proved. Recently, a club called the American Mi-Ki Registry Association utilized genetic specialists to create a specific DNA marker for the Mi-Ki breed. Today, this rare breed is responsible for the establishment of numerous clubs worldwide, but it is not recognized by noted kennel clubs like the AKC or the UKC. 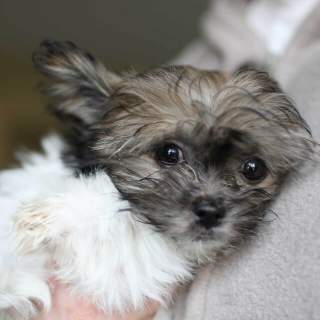 Disreputable breeders will crossbreed similar breeds that share a Mi-Ki's ancestry--the Maltese, the Papillon, and even the Pomeranian and Pekingese--then sell them as "true" Mi-Kis, when they are in fact not. These "fake" Mi-Kis may be virtually identical to true Mi-Kis appearance-wise, but they invariably shed profusely or do not have the good-natured temperament of an authentic Mi-Ki. Owners who are curious about their Mi-Ki's exact heritage can contact canine DNA testing organizations for more info. You may notice some differences when searching for Mi-Ki puppies for sale-- they can have either smooth, short-haired coats or a long, silky ones. A smooth-coat Mi-Ki has short hair that lies close to its body, and little or no facial hair; the long-haired types, meanwhile, have straight, silky fur with a beard and/or mustache and abundant feathering on the ears. Both coat types exist in a variety of colors; the coats are usually one primary color with patches of another color. As previously stated, an authentic Mi-Kii exists only in toy size: less than 10 pounds in weight, and less than 10 inches in height. Below are pictures and images of the Mi-Ki dog breed. A Mi-Ki will make an excellent living companion. They are happiest when they have plenty of contact with humans and other pets. They're not overly "yappy," and they're extremely affectionate. Mi-Kis are indoor dogs and make great companions for apartments and condos. Like most toy breeds, the Mi-Ki should not be left outside unsupervised, especially in areas that put them at risk of being targeted by predators or larger dogs. They're not at all destructive, and they socialize very well with other household animals. Mi-Ki dogs are hypoallergenic, too, so they're great for allergy sufferers; it is believed, in fact, that these dogs were developed to shed very little, or none at all. The Mi-ki breed is known for having exceptional health. Due to careful breeding methods, dogs of this breed have very few known health issues. A few Mi-Kis, particularly those with especially short muzzles, may encounter breathing problems; others may have poor dental health, and will need their teeth brushed regularly.